Are you a small business competing with bigger brand names? Do you communicate business value and a mission statement with a magic tagline ? A strong and clear tagline is the brand vision and marketing foundation of every business. Nothing beats an inspirational and aspirational tagline to set your business brand apart in competitive markets. And a powerful tagline will boost personal branding actions and team confidence no end. The sense of pride and motivation to deliver on that vision and mission cannot be under-estimated. It’s a core part of personal and business branding and is fun to create. 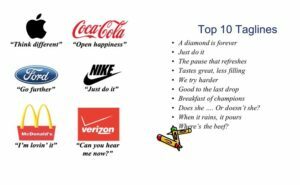 And here’s the 1st bit of magic – taglines are not just for big corporates, products and global brands. They are just as relevant and valuable for SME’s, solo coaches and consultants. Perhaps even more so as they are fighting to stand up and out in saturated and highly competitive markets without the big marketing $$. And it is equally important for service businesses as product. Yet there is often an unspoken perception that unless you are at the big end of town you may come across as pretentious or even a bit wanky with one. It’s of course nonsense and actually the reverse. But only 30% of SMEs and consultants have one and if they do they are often quite stock standard or uninspiring. Is a great attraction tool for new staff, top notch suppliers etc. A tagline is a bit like a puppy – you buy one for life. And whilst you can pivot if your business changes, a tagline is all enduring and you just MUST be in love with it. You must feel really excited and energised when you see, hear and read your tagline. And so should your market. DARE Group have created 100s of cracker tagline for clients when we dig to uncover their personal and business brand golden nuggets. Magic happens when your tagline jumps!